This leaflet is advertising a promotional offer by the manufacturers of Matchless cleaner (a cleaning product) and Venus soap. 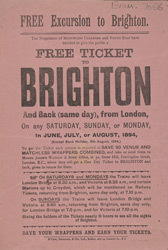 On collecting 90 wrappers from the specified soap products the customer would receive a free return train ticket to Brighton. In the 19th century the trains were a relatively new transport system and to travel from London to the seaside would have been a luxury. The working classes were given Saturday afternoon off work and after bank holidays were introduced 1871 many people enjoyed excursion to seaside resorts.